Protecting our wonderful historic sites is an important part of our Heritage. Historic England in partnership with Country Eye have made reporting Heritage Crime quick and easy with a Free App. Heritage crime is any offence which targets the historic environment. It includes crimes against archaeological sites, churches, castles stately homes and historic shipwrecks. It also includes crimes against cultural property and museum collections. Heritage crime covers a wide variety of criminal activity which can cause loss or damage to heritage assets forever. These include – architectural theft, in particular the theft of metal and stone, anti-social behaviour, criminal damage, arson, unauthorised excavation and metal detecting (also known as ‘night-hawking’) damage by vehicles and the trade in illicit cultural property. How to report an incident? Download the Country Eye App from the relevant app store, register your details and then you will be able to use the app to report the crime. This will then be viewed by a dedicated team of volunteers who will let the relevant authorities know. You may be contacted for further details. Please remember if it is an emergency or a crime in progress you must call 999. When to call the emergency number? Violence is being used or threatened. Alternatively you can call 101 – National non-emergency number. You should call 101 to report crime and other concerns that do not require an emergency response. Launched in 2011, the Alliance to Reduce Crime against Heritage (ARCH), is a voluntary national network which takes forward initiatives to tackle heritage crime and galvanise local action as part of the Heritage Crime Programme. The overriding objective of the group is to reduce the amount of crime that causes damage to or interferes with the enjoyment of heritage assets in England. Members of ARCH have a shared interest in preventing and seeing effective enforcement of heritage crime. Through conferences and training events, the group is a means of discussing priorities, sharing information about heritage crime, carrying out training, highlighting best practice and making local contacts. Membership of the group is free and open to all organisations and groups that have an interest in preventing and enforcing heritage crime. If you are interested in finding out more about the Heritage Crime Programme, or becoming a member of ARCH please contact Historic England’s Customer Services Team. Look after the historic environment, providing expert advice, helping people protect and care for it, and helping the public to understand and enjoy it. Protecting historic places through the designation system is at the very heart of what they do, as expert advisor to the government. Using knowledge and understanding they celebrate what’s special and make sure that England’s history is recognised, respected and enjoyed. Historic England manage the National Heritage List for England: from its origins in 1882, it has grown to include almost 400,000 items ranging from prehistoric monuments to office blocks, battlefields and parks. They all benefit from legal protection. Historic England & Country Eye working in partnership to ‘Help keep the countryside and the past safe’. Country Eye Ltd have built a free App for people living and working in the rural community. The app allows users to record and share information on crime, suspicious behaviour and damage in their home community or whilst out and about. 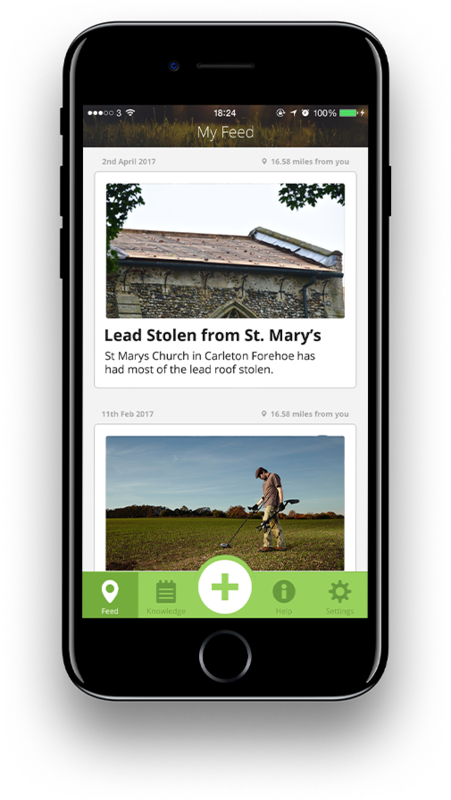 The Crime, Rural Advisory Group (CRAG) in Kent, commissioned the design and build of the Country Eye app. The app has been built to help residents and farmers in Kent report information quickly and efficiently. This information is securely stored in a central database and accessed by the voluntary Country Eye team who are fully trained by Kent Police. The team analyse and disseminate the information and then broadcast it out to other local app users.